Mount the hinges of the fixed door onto the mounting plates on the cabinet side. 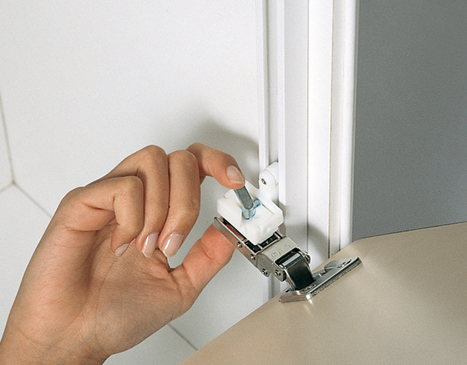 We recommend the use of SALICE hinge 329.17.600 with mounting plate 329.71.500 or similar. Position the sliding block inside the rail by rotating it 90°. Lock the sliding block into position by turning the lever, marked in red. 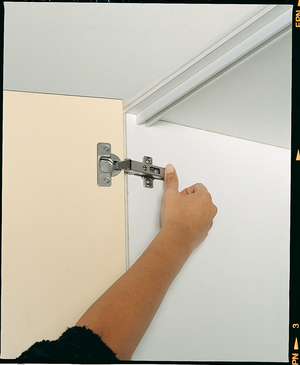 SALICE Hinges must be used when mounting doors onto carcase, to comply with warranty.